Visibility is the motto of Flexi’s Neon Leash. This highly reflective retractable leash offers increased safety for dogs and their owners after dark. In addition to the very visible neon-colored cord or tape, the leash also has a housing with reflective tape on both sides. Microprisms in the tape make the leash visible when it is hit by headlights from up to 160 yards away. 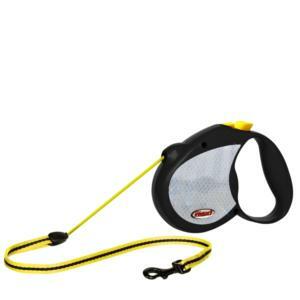 The Flexi Reflect retractable leash features 3M Highway Grade Reflective Sheeting on both sides of the leash casing. When a light source (street lights, headlights, etc.) shines onto the Flexi Reflect, the reflective sheeting provides a bright glow to provide enhanced the visibility and improved safety. The Flexi Reflect also has neon yellow accents to improve visibility during any daytime or nighttime walk..